This is a story about Wanda. But, it is also a story about Maddie, and about Peggy. It is a story about being a little different, and a story about bullying and how a group treats someone who is a little different. Wanda was a little different than the other girls in her class. She lived with her father and brother on Boggins Heights, a little way out of town. Her last name was Petronski, which was different from the other last names in the class (like Smith, and Allen). And, she always wore the same light blue, faded (but clean) dress. The teacher had her sit in the back of the class with the rowdy boys (although she was quiet). Maddie was poor, too, but not as poor as Wanda. Maddie sat in the front row of the class, and got good grades. She was best friends with Peggy, who was the most popular girl in the class. Nobody really thought much about Wanda, until one day on the way to school. The girls had gathered around to admire someone’s new dress. They all were happy and talking excitedly. Wanda walked by with her big brother, then hesitated, and slowly joined the group. Wanda did say something. 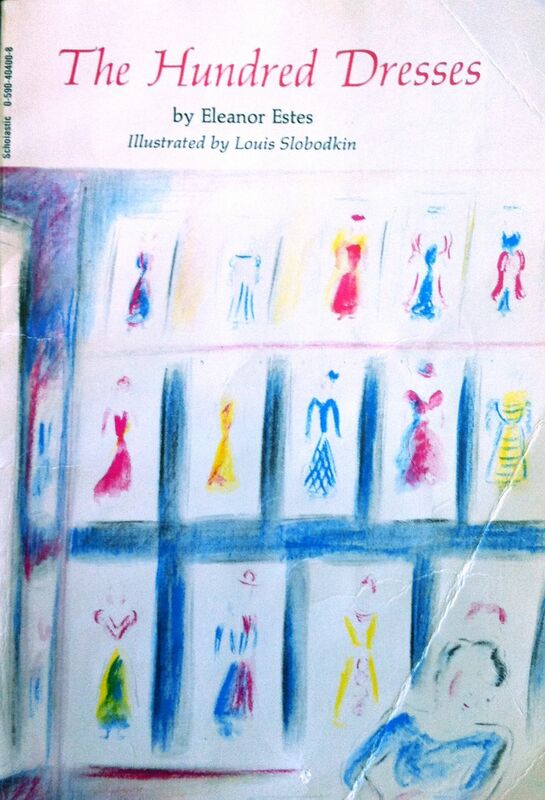 Wanda told Peggy that she, Wanda, had a hundred dresses at home. Peggy shouted this information to the crowd, which turned silent, and turned toward Wanda and Peggy. When the school bell rang, the girls ran off laughing and talking, and forgetting about Wanda….until Peggy remembered each day to have ‘fun’ with Wanda by asking her about the hundred dresses. Maddie wasn’t happy about the ‘fun’ they were having with Wanda. It made her feel uncomfortable inside, and made her wish Peggy would stop. But, Maddie didn’t say anything. One day Wanda wasn’t in school. She wasn’t there the next day, or the day after that. Maddie noticed, and wondered. Peggy noticed, too, because she looked for Wanda to have ‘fun’ with her. The school had a drawing contest for each class – one for boys and one for girls. Everyone assumed that Peggy would win because she could draw so well. On the day the winners were to be announced, the children entered their classroom and found it covered in beautiful, colorful pictures of dresses. 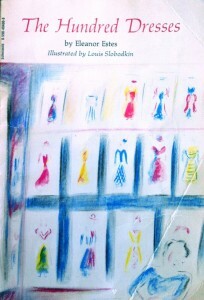 The teacher announced that Wanda had won the contest with her one hundred drawings of different dresses. Everyone admired them. But, Wanda wasn’t there. A little later, the teacher read a letter to the class written by Wanda’s father. The letter said that Wanda and her brother were not going to that school anymore. The family had moved to the city. They had left because of teasing and generally feeling unwelcome. Maddie felt horrible. She and Peggy walked up Boggins Heights to see if Wanda really had left — the house was empty, the family gone. Maddie did some serious thinking on her own. Maddie and Peggy wrote a letter to Wanda, intending to apologize, but ended up just being a friendly letter. Just before Winter break, the class received a letter from Wanda, telling them to keep the drawings of dresses, and saying that one in particular was for Maddie, and one for Peggy. When Maddie got home, she cried and stared at drawing carefully hung up in her room – and realized that it was a picture of her, and that Peggy’s was a picture of Peggy – in dresses Wanda had created and described to them when they were having ‘fun’ with her. This is a strong story with some messages about bullying and treatment of others – but, it is not preachy, and it doesn’t talk down to the reader. Maddie makes her own realizations and decisions not to stand by ever again while someone is being mistreated. This story was first published in 1944, so it has a few things from that era that readers may notice. All of the girls wear dresses to school. The school desks are lined up in rows, rather than grouped or in tables as many classrooms do now. And, there is a drawing contest – the girls are to draw dresses, and the boys are to draw motorboats. I don’t think these things take away from the story. When my daughter noticed, we talked about different attitudes and expectations in different times in history.